SnowCast works similarly to Dark Sky. In fact, you can probably think of it as the Dark Sky of snow. Dark Sky predicts snow accumulations as well, but not in anywhere near as great of detail as SnowCast. If you enable push notifications in SnowCast, it will send you notices about upcoming snow totals too. You can customize these to only get notice when the snow will total to one inch or more, two inches, five inches or eight inches. With push notifications on, you’ll barely ever have to open the app. You might want to anyway though — the app is extremely well designed and breaks down the forecast into even more detail. Underneath the general forecast at the top is a graph that separates snow totals across the 48 hours. The breakdown of snow totals over several hours won me over. For instance, when I used the app, I could see that it’s going to snow the heaviest in Minneapolis at around 1 a.m. on Tuesday. Around that time, they’ll be getting about 2.2 inches of snow. If I tap that, the forecast above updates to cover the entire total up until that point: 4.33 inches over the next 12 hours. SnowCast also shows you any active NOAA winter weather warnings or advisories. Select that if you’re under one to see the full report. You can also tap Radar at the very bottom to view an animation of the snow passing through your area over the next several hours. 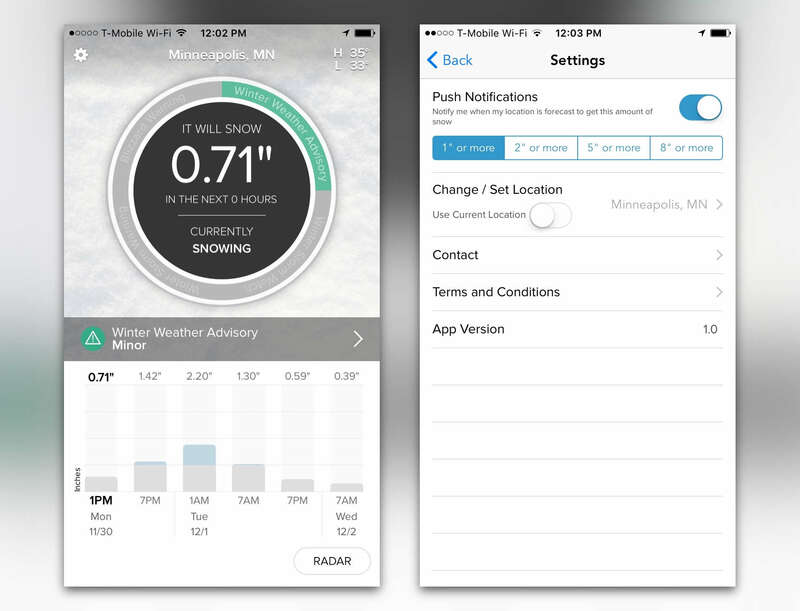 The accuracy of SnowCast is yet to be determined, but the developers promise the app is “backed by sophisticated snow prediction and forecast data helping you quickly know if your location will get a snow storm or just a dusting.” I also took the liberty of checking out Dark Sky’s time-tested forecast for Minneapolis, which predicts the city is getting 4 to 8 inches of snow today and tomorrow. SnowCast predicts a total of 6.61 inches, falling neatly within Dark Sky’s range. 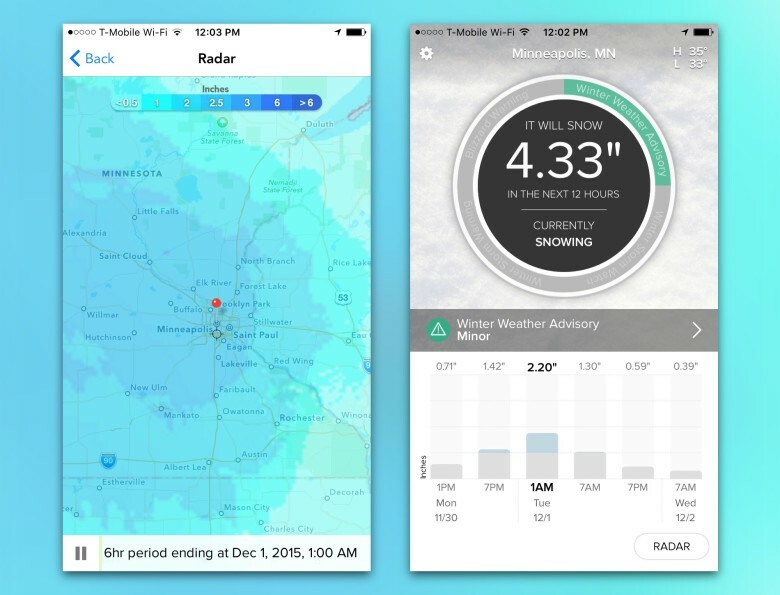 SnowCast is a polished and very useful app for those of us living in the northern half of the United States. I’m excited to keep using it as cold air settles in over the next few weeks. It’s not currently snowing in my location, but between my experience and the solid reviews in the App Store, the accuracy looks favorable. It’s a universal app for both iPhone and iPad and sells for a decent $2.99.